Abstract: Olfactory dysfunction is frequent in Parkinson’s disease (PD). A correlation between olfactory dysfunction and the pathophysiological process of the disease has been confirmed. On the other hand, olfaction disturbances are also prevalent in other neurodegenerative diseases, and may be related to other factors such as gender, age, smoking, and trauma. Clinically, hyposmia is commonly assessed by smell identification testing. Good diagnostic accuracy has been widely reported, but differences in sensitivity and specificity due to sociocultural factors have also been reported. Since hyposmia may be present before the onset of motor symptoms, it has the potential to serve as a biomarker for the identification of subjects at risk of developing PD. Several studies have been conducted to assess the utility of smell testing as an isolated or combined biomarker for this end. Finally, severe olfactory dysfunction has been associated with faster disease progression and higher risk of cognitive decline in patients with PD. Olfactory dysfunction assessment in PD will continue to be relevant in research and clinical practice. Despite all of its amazing properties, the sense of smell is often neglected from medical care until it is partially or completely lost. During the last years, smell dysfunction has been associated with several neurodegenerative diseases including Parkinson’s disease (PD). Hyposmia in PD has allowed to better understand the physiopathology of the disease, to improve the accuracy of clinical diagnosis, and has been proposed as a viable biomarker for the disease. The objective of this review is to highlight the current state of the art of olfactory dysfunction in PD, from both a theoretical and clinical standpoint. On this matter, this review will aid in translating basic science concepts to the day-to-day clinical practice, while providing enough background for understanding and developing new research. From the clinical standpoint, olfactory dysfunction is usually associated with anosmia, hyposmia, and dysosmia. Anosmia and hyposmia refer to a complete and partial loss of smell, respectively. On the other hand, identification and discrimination of different odors require memory and other higher order cortical interactions; an alteration in either of these processes is termed dysosmia. To better understand the role of olfactory impairment in PD, some familiarities with the olfactory system, factors affecting smell identification, and Lewy body deposition are needed. Some of the axons of tufted and mitral cells reach the pyramidal cells of the anterior olfactory nucleus (AON), which in turn send their own axons to primary olfactory cortices. Some other axons of tufted and mitral cells travel directly to primary olfactory cortices; nevertheless, all these axons converge and form the olfactory tract. On the other hand, the olfactory tract divides into a median and a lateral olfactory stria. Some of these fibers decussate and reach the contralateral olfactory cortex; the fibers of the lateral stria reach the piriform cortex, the anterior cortical nucleus of the amygdala, the periamygdaloid cortex, and the entorhinal cortex.8 These regions form the primary olfactory cortex, which connects with other cortical and subcortical areas, such as the orbitofrontal cortex, the amygdala, the hypothalamus, the thalamus, and the nucleus accumbens. The association between hyposmia and PD was first reported more than 30 years ago.32 Prevalence of olfactory dysfunction in PD is around 90%;33 some variation may be found as a consequence of the study sample, olfactory impairment definition, or the assessing tool used. Psychophysical tests are the most widely used for quantifying olfactory function. These tests can evaluate different functional modalities of olfaction such as odor sensitivity (i.e., threshold tests), odor discrimination, and odor identification.42,43 Smell threshold testing is based on odor detection or sensitivity; the test helps in finding the lowest concentration of an odorant perceived by a subject. Smell discrimination testing assesses the capacity of the subject to distinguish different odorants. Lastly, smell identification testing relies on the perception and correct naming of an odorant. Most studies assessing olfaction in PD use odor identification tests. The University of Pennsylvania Smell Identification Test (UPSIT) is arguably the identification test used worldwide. It consists of 40 microencapsulated odors, which are released after scratching the surface with a pencil. The subjects are then asked to identify each odorant from a multiple choice list (four options for each smell item).44,45 A shortened version of the UPSIT is available; the Brief Smell Identification Test (B-SIT) comprises 12 items, while the Quick Smell Identification Test with only three items serves more as a screening tool. As mentioned previously, olfactory deficit is a common clinical sign in PD, present in 70–90% of the patients, and is one of the most noticeable non-motor features of disease.41,42,48 Moreover, several studies have showed that olfactory dysfunction can appear years prior to the onset of motor symptoms.23,26,41 Consequently, olfactory dysfunction may be useful to aid in the clinical diagnosis of PD. The association between motor subtypes of PD and smell identification has been less studied. Iijima et al found that smell impairment was more frequent in the akinetic-rigid subtype.60 Given the different course of the disease according to the predominant motor phenotype, olfactory dysfunction may have a role as a prognosis biomarker as mentioned later in the text. As mentioned before, there are several studies that support olfactory dysfunction as a feature of premotor PD; nevertheless, smell loss is also found in other neurodegenerative diseases.63,64 Therefore, to improve its clinical use, a combination of two or more different biomarkers may increase the reliability of smell testing. Haugen et al reported that 97.8% of PD patients with positron emission tomography (PET) evidence of nigrostriatal denervation have impaired olfaction;65 thus, nuclear medicine neuroimaging is a useful related biomarker. In the previously mentioned study of first-degree relatives of PD, reduction of striatal binding ratios in the SPECT was found in five of hyposmic subjects; four of them developed clinical PD. These data suggest that olfactory test followed by a SPECT improves the specificity for detecting premotor PD. López-Hernández et al reported a similar diagnostic value by combining the SS-12 and hyperechogenicity of the substantia nigra assessed by transcranial duplex ultrasound.69 Although this approach is less expensive than a PET or SPECT study, ultrasound may yield more errors due to its operator-dependent nature. Theoretically, olfactory dysfunction along with other premotor biomarkers can be used to identify subjects with an increased risk of developing PD. Although currently neuroprotective treatment is not available, the proper identification of these “enriched” populations will be of great value for the development of such therapies. In summary, assessment of olfactory dysfunction is the key in the study designs recruiting Parkinson’s at-risk subjects; Table 2 shows a brief description of these studies and the role of olfactory dysfunction. Abbreviations: PD, Parkinson’s disease; UPSIT, University of Pennsylvania Smell Identification Test; SS, Sniffin’ sticks; SWEDD, Scan without Evidence of Dopaminergic Deficit; RBD, REM sleep behavior disorder. Fullard et al evaluated the relation between olfaction and cognition. They reported that lower UPSIT scores at baseline were associated with a greater rate of decline in cognition as assessed by the Montreal Cognitive Assessment.81 It has been reported that patients with severe hyposmia have an 18-fold increase in the risk for dementia within 3 years.82 Another frequent and important premotor feature is RBD. Kang et al assessed the combined effect of RBD and hyposmia on cognition and motor phenotype. They found that patients with both RBD and olfactory dysfunction were more prone to have cognitive decline; also, patients with RBD and/or hyposmia had an akinetic-rigid predominant phenotype.83 Overall, severe hyposmia appears to be a reliable marker of risk of cognitive decline in patients with PD. Smell testing may be useful as a supportive marker for differentiating LRRK2 PD from idiopathic PD in the absence of genetic testing. There is no doubt that olfactory dysfunction is a key non-motor manifestation of PD. Hyposmia may be present in 70–90% of patients with PD and precedes the motor symptom onset for several years. Moreover, olfactory dysfunction has an accurate pathological correlation with the postulated rostrocaudal disease progression. For clinicians, smell identification testing is a reliable and relatively affordable method for olfaction assessment. The most commonly used smell identification tests are the UPSIT and the SS; nevertheless, it is important to consider differences in sensitivity and specificity of these tests according to cultural differences. Olfactory dysfunction in combination with other possible markers of disease progression, such as dopaminergic neuroimaging, yields a positive predictive value of 97% for differentiating PD from other parkinsonisms. Consequently, clinicians may consider olfactory tests as a routine assessment in patients with clinical suspicion of early PD and also in cases of unclassified parkinsonism. In the near future, olfactory dysfunction may prove to be useful for the identification of subjects for neuroprotective and disease modifying therapy clinical trials. MRV has received honoraria from UCB, Boehringer-Ingelheim, Medtronic, Teva, and Vanquish. The other authors report no other conflicts of interest in this work. Chu S, Downes JJ. Odour-evoked autobiographical memories: psychological investigations of proustian phenomena. Chem Senses. 2000;25(1):111–116. Wilson RI, Mainen ZF. Early events in olfactory processing. Annu Rev Neurosci. 2006;29:163–201. Benarroch EE. Olfactory system: functional organization and involvement in neurodegenerative disease. Neurology. 2010;75(12):1104–1109. Duda JE. Olfactory system pathology as a model of Lewy neurodegenerative disease. J Neurol Sci. 2010;289(1–2):49–54. Chen WR, Shepherd GM. The olfactory glomerulus: a cortical module with specific functions. J Neurocytol. 2005;34(3–5):353–360. Gómez C, Briñón JG, Barbado MV, Weruaga E, Valero J, Alonso JR. Heterogeneous targeting of centrifugal inputs to the glomerular layer of the main olfactory bulb. J Chem Neuroanat. 2005;29(4):238–254. Brunjes PC, Illig KR, Meyer EA. A field guide to the anterior olfactory nucleus (cortex). Brain Res Brain Res Rev. 2005;50(2):305–335. Schiffman SS, Graham BG. Taste and smell perception affect appetite and immunity in the elderly. Eur J Clin Nutr. 2000;54(Suppl 3): S54–S63. Oliveira-Pinto AV, Santos RM, Coutinho RA, et al. Sexual dimorphism in the human olfactory bulb: females have more neurons and glial cells than males. PLoS One. 2014;9(11):e111733. Doty RL, Shaman P, Applebaum SL, Giberson R, Siksorski L, Rosenberg L. Smell identification ability: changes with age. Science. 1984;226(4681):1441–1443. Doty RL, Kamath V. The influences of age on olfaction: a review. Front Psychol. 2014;5:20. Murphy C, Schubert CR, Cruickshanks KJ, Klein BE, Klein R, Nondahl DM. Prevalence of olfactory impairment in older adults. JAMA. 2002;288(18):2307–2312. Moccia M, Picillo M, Erro R, et al. How does smoking affect olfaction in Parkinson’s disease? J Neurol Sci. 2014;340(1–2):215–217. Calderón-Garcidueñas L, Franco-Lira M, Henríquez-Roldán C, et al. Urban air pollution: influences on olfactory function and pathology in exposed children and young adults. Exp Toxicol Pathol. 2010;62(1):91–102. Spillantini MG, Schmidt ML, Lee VM, Trojanowski JQ, Jakes R, Goedert M. Alpha-synuclein in Lewy bodies. Nature. 1997;388(6645):839–840. Spillantini MG, Crowther RA, Jakes R, Hasegawa M, Goedert M. alpha-Synuclein in filamentous inclusions of Lewy bodies from Parkinson’s disease and dementia with Lewy bodies. Proc Natl Acad Sci U S A. 1998; 95(11):6469–6473. Ross GW, Abbott RD, Petrovitch H, et al. Association of olfactory dysfunction with incidental Lewy bodies. Mov Disord. 2006;21(12):2062–2067. Beach TG, White CL 3rd, Hladik CL, et al. Olfactory bulb alpha-synucleinopathy has high specificity and sensitivity for Lewy body disorders. Acta Neuropathol. 2009;117(2):169–174. Braak H, Del Tredici K, Rüb U, de Vos RA, Jansen Steur EN, Braak E. Staging of brain pathology related to sporadic Parkinson’s disease. Neurobiol Aging. 2003;24(2):197–211. Braak H, Ghebremedhin E, Rüb U, Bratzke H, Del Tredici K. Stages in the development of Parkinson’s disease-related pathology. Cell Tissue Res. 2004;318(1):121–134. Halliday GM, McCann H. The progression of pathology in Parkinson’s disease. Ann N Y Acad Sci. 2010;1184:188–195. Ross GW, Petrovitch H, Abbott RD, et al. Association of olfactory dysfunction with risk for future Parkinson’s disease. Ann Neurol. 2008;63(2):167–173. Haehner A, Hummel T, Hummel C, Sommer U, Junghanns S, Reichmann H. Olfactory loss may be a first sign of idiopathic Parkinson’s disease. Mov Disord. 2007;22(6):839–842. Haehner A, Hummel T, Reichmann H. Olfactory dysfunction as a diagnostic marker for Parkinson’s disease. Expert Rev Neurother. 2009;9(12):1773–1779. Ponsen MM, Stoffers D, Booij J, van Eck-Smit BL, Wolters ECh, Berendse HW. Idiopathic hyposmia as a preclinical sign of Parkinson’s disease. Ann Neurol. 2004;56(2):173–181. Ponsen MM, Stoffers D, Twisk JW, Wolters ECh, Berendse HW. Hyposmia and executive dysfunction as predictors of future Parkinson’s disease: a prospective study. Mov Disord. 2009;24(7):1060–1065. Sengoku R, Saito Y, Ikemura M, et al. Incidence and extent of Lewy body-related alpha-synucleinopathy in aging human olfactory bulb. 2008;67(11):1072–1083. Harding AJ, Stimson E, Henderson JM, Halliday GM. Clinical correlates of selective pathology in the amygdala of patients with Parkinson’s disease. Brain. 2002;125(Pt 11):2431–2445. Altinayar S, Oner S, Can S, Kizilay A, Kamisli S, Sarac K. Olfactory disfunction and its relation olfactory bulb volume in Parkinson’s disease. Eur Rev Med Pharmacol Sci. 2014;18(23):3659–3664. Hakyemez HA, Veyseller B, Ozer F, et al. Relationship of olfactory function with olfactory bulbus volume, disease duration and Unified Parkinson’s disease rating scale scores in patients with early stage of idiopathic Parkinson’s disease. J Clin Neurosci. 2013;20(10):1469–1470. Ansari KA, Johnson A. Olfactory function in patients with Parkinson’s disease. J Chronic Dis. 1975;28(9):493–497. Xiao Q, Chen S, Le W. Hyposmia: a possible biomarker of Parkinson’s disease. Neurosci Bull. 2014;30(1):134–140. Wenning GK, Shephard B, Hawkes C, Petruckevitch A, Lees A, Quinn N. Olfactory function in atypical parkinsonian syndromes. Acta Neurol Scand. 1995;91(4):247–250. Zou YM, Lu D, Liu LP, Zhang HH, Zhou YY. Olfactory dysfunction in Alzheimer’s disease. Neuropsychiatr Dis Treat. 2016;12:869–875. Moscovich M, Munhoz RP, Teive HA, et al. Olfactory impairment in familial ataxias. J Neurol Neurosurg Psychiatry. 2012;83(10):970–974. Driver-Dunckley E, Adler CH, Hentz JG, et al; Arizona Parkinson Disease Consortium. Olfactory dysfunction in incidental Lewy body disease and Parkinson’s disease. Parkinsonism Relat Disord. 2014;20(11):1260–1262. Hawkes C. Olfaction in neurodegenerative disorder. Adv Otorhinolaryngol. 2006;63:133–151. Katzenschlager R, Lees AJ. Olfaction and Parkinson’s syndromes: its role in differential diagnosis. Curr Opin Neurol. 2004;17(4):417–423. Hawkes C. Olfaction in neurodegenerative disorder. Mov Disord. 2003;18(4):364–372. Doty RL, Deems DA, Stellar S. Olfactory dysfunction in parkinsonism: a general deficit unrelated to neurologic signs, disease stage, or disease duration. Neurology. 1988;38(8):1237–1244. Doty RL. Olfaction in Parkinson’s disease and related disorders. Neurobiol Dis. 2012;46(3):527–552. Potagas C, Dellatolas G, Ziegler M, et al. Clinical assessment of olfactory dysfunction in Parkinson’s disease. Mov Disord. 1998;13(3):394–399. Doty RL, Shaman P, Dann M. Development of the University of Pennsylvania Smell Identification Test: a standardized microencapsulated test of olfactory function. Physiol Behav. 1984;32(3):489–502. Doty RL, Shaman P, Kimmelman CP, Dann MS. University of Pennsylvania Smell Identification Test: a rapid quantitative olfactory function test for the clinic. Laryngoscope. 1984;94(2 Pt 1):176–178. Hummel T, Sekinger B, Wolf SR, Pauli E, Kobal G. ‘Sniffin’ sticks’: olfactory performance assessed by the combined testing of odor identification, odor discrimination and olfactory threshold. Chem Senses. 1997;22(1):39–52. Lawton M, Hu MT, Baig F, et al. Equating scores of the University of Pennsylvania Smell Identification Test and Sniffin’ Sticks test in patients with Parkinson’s disease. Parkinsonism Relat Disord. 2016;33:96–101. Doty RL, Bromley SM, Stern MB. Olfactory testing as an aid in the diagnosis of Parkinson’s disease: development of optimal discrimination criteria. Neurodegeneration. 1995;4(1):93–97. Doty RL, Stern MB, Pfeiffer C, Gollomp SM, Hurtig HI. Bilateral olfactory dysfunction in early stage treated and untreated idiopathic Parkinson’s disease. J Neurol Neurosurg Psychiatry. 1992;55(2):138–142. Tissingh G, Berendse HW, Bergmans P, et al. Loss of olfaction in de novo and treated Parkinson’s disease: possible implications for early diagnosis. Mov Disord. 2001;16(1):41–46. Boesveldt S, Verbaan D, Knol DL, et al. A comparative study of odor identification and odor discrimination deficits in Parkinson’s disease. Mov Disord. 2008;23(14):1984–1990. Boesveldt S, de Muinck Keizer RJ, Knol DL, Wolters ECh, Berendse HW. Extended testing across, not within, tasks raises diagnostic accuracy of smell testing in Parkinson’s disease. Mov Disord. 2009;24(1):85–90. Hawkes CH, Shephard BC, Daniel SE. Olfactory dysfunction in Parkinson’s disease. J Neurol Neurosurg Psychiatry. 1997;62(5):436–446. Rodríguez-Violante M, Lees AJ, Cervantes-Arriaga A, Corona T, Silveira-Moriyama L. Use of smell test identification in Parkinson’s disease in Mexico: a matched case-control study. Mov Disord. 2011;26(1):173–176. Rodríguez-Violante M, Gonzalez-Latapi P, Camacho-Ordoñez A, Martínez-Ramírez D, Morales-Briceño H, Cervantes-Arriaga A. Comparing the accuracy of different smell identification tests in Parkinson’s disease: relevance of cultural aspects. Clin Neurol Neurosurg. 2014;123:9–14. Miyamoto T, Miyamoto M, Iwanami M, Suzuki K, Inoue Y, Hirata K. Odor identification test as an indicator of idiopathic REM sleep behavior disorder. Mov Disord. 2009;24(2):268–273. Silveira-Moriyama L, Carvalho Mde J, Katzenschlager R, et al. The use of smell identification tests in the diagnosis of Parkinson’s disease in Brazil. Mov Disord. 2008;23(16):2328–2334. Santin R, Fonseca VF, Bleil CB, Rieder CR, Hilbig A. Olfactory function and Parkinson’s disease in Southern Brazil. Arq Neuropsiquiatr. 2010;68(2):252–257. Picillo M, Pellecchia MT, Erro R, et al. The use of University of Pennsylvania Smell Identification Test in the diagnosis of Parkinson’s disease in Italy. Neurol Sci. 2014;35(3):379–383. Iijima M, Kobayakawa T, Saito S, et al. Differences in odor identification among clinical subtypes of Parkinson’s disease. Eur J Neurol. 2011;18(3):425–429. Abbott RD, Ross GW, White LR, et al. Environmental, life-style, and physical precursors of clinical Parkinson’s disease: recent ﬁndings from the Honolulu-Asia Aging Study. J Neurol. 2003;250(Suppl 3): III30–III39. Ponsen MM, Stoffers D, Wolters ECh, Booij J, Berendse HW. Olfactory testing combined with dopamine transporter imaging as a method to detect prodromal Parkinson’s disease. J Neurol Neurosurg Psychiatry. 2010;81(4):396–399. Serby M, Larson P, Kalkstein D. The nature and course of olfactory deficits in Alzheimer’s disease. Am J Psychiatry. 1991;148(3):357–360. Mesholam RI, Moberg PJ, Mahr RN, Doty RL. Olfaction in neurodegenerative disease: a meta-analysis of olfactory functioning in Alzheimer’s and Parkinson’s diseases. Arch Neurol. 1998;55(1):84–90. Haugen J, Müller ML, Kotagal V, et al. Prevalence of impaired odor identification in Parkinson disease with imaging evidence of nigrostriatal denervation. J Neural Transm (Vienna). 2016;123(4):421–424. Siderowf A, Newberg A, Chou KL, et al. [99mTc]TRODAT-1 SPECT imaging correlates with odor identification in early Parkinson disease. Neurology. 2005;64(10):1716–1720. Borghammer P, Knudsen K, Østergaard K, et al. Combined DaT imaging and olfactory testing for differentiating parkinsonian disorders. Int J Clin Pract. 2014;68(11):1345–1351. Georgiopoulos C, Davidsson A, Engström M, Larsson EM, Zachrisson H, Dizdar N. The diagnostic value of dopamine transporter imaging and olfactory testing in patients with parkinsonian syndromes. J Neurol. 2015;262(9):2154–2163. López-Hernández N, García-Escrivá A, Shalabi Benavent M. Diagnostic value of combined assessment of olfaction and sustantia nigra hyperechogenicity for Parkinson’s disease. Neurología. 2015;30(8):496–501. Mizutani Y, Nakamura T, Okada A, et al. Hyposmia and cardiovascular dysautonomia correlatively appear in early-stage Parkinson’s disease. Parkinsonism Relat Disord. 2014;20(5):520–524. Navarro-Otano J, Gaig C, Muxi A, et al. 123I-MIBG cardiac uptake, smell identification and 123I-FP-CIT SPECT in the differential diagnosis between vascular parkinsonism and Parkinson’s disease. Parkinsonism Relat Disord. 2014;20(2):192–197. Noyce AJ, Bestwick JP, Silveira-Moriyama L, et al. PREDICT-PD: identifying risk of Parkinson’s disease in the community: methods and baseline results. J Neurol Neurosurg Psychiatry. 2014;85(1):31–37. Noyce AJ, R’Bibo L, Peress L, et al. 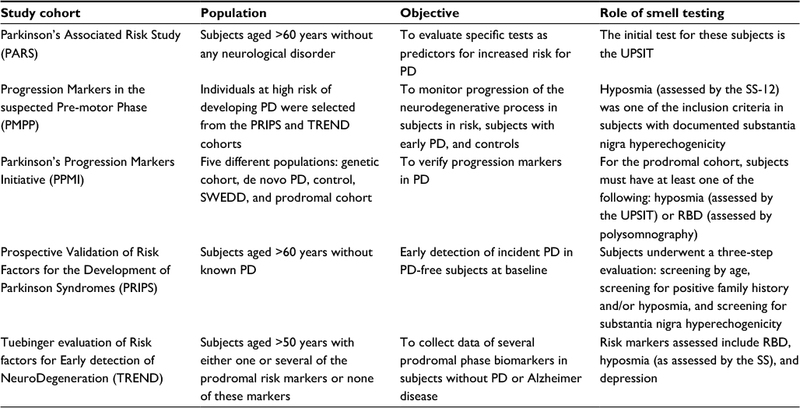 PREDICT-PD: an online approach to prospectively identify risk indicators of Parkinson’s disease. Mov Disord. 2017;32(2):219–226. Parkinson Progression Marker Initiative. The Parkinson Progression Marker Initiative (PPMI). Prog Neurobiol. 2011;95(4):629–635. Berg D, Godau J, Seppi K, et al. The PRIPS study: screening battery for subjects at risk for Parkinson’s disease. Eur J Neurol. 2013;20(1):102–108. Berg D. Is pre-motor diagnosis possible? The European experience. Parkinsonism Relat Disord. 2012;18(Suppl 1):S195–S198. Gaenslen A, Wurster I, Brockmann K, et al. Prodromal features for Parkinson’s disease – baseline data from the TREND study. Eur J Neurol. 2014;21(5):766–772. Liepelt-Scarfone I, Gauss K, Maetzler W, et al. Evaluation of progression markers in the premotor phase of Parkinson’s disease: the progression markers in the premotor phase study. Neuroepidemiology. 2013;41(3–4):174–182. Berg D, Postuma RB, Adler CH, et al. MDS research criteria for prodromal Parkinson’s disease. Mov Disord. 2015;30(12):1600–1611. Fullard ME, Tran B, Xie SX, et al. Olfactory impairment predicts cognitive decline in early Parkinson’s disease. Parkinsonism Relat Disord. 2016;25:45–51. Baba T, Kikuchi A, Hirayama K, et al. Severe olfactory dysfunction is a prodromal symptom of dementia associated with Parkinson’s disease: a 3 year longitudinal study. Brain. 2012;135(Pt 1):161–169. Kang SH, Lee HM, Seo WK, Kim JH, Koh SB. The combined effect of REM sleep behavior disorder and hyposmia on cognition and motor phenotype in Parkinson’s disease. J Neurol Sci. 2016;368:374–378. Johansen KK, Warø BJ, Aasly JO. Olfactory dysfunction in sporadic Parkinson’s Disease and LRRK2 carriers. Acta Neurol Scand. 2014;129(5):300–306. Saunders-Pullman R, Stanley K, Wang C, et al. Olfactory dysfunction in LRRK2 G2019S mutation carriers. Neurology. 2011;77(4):319–324. Silveira-Moriyama L, Guedes LC, Kingsbury A, et al. Hyposmia in G2019S LRRK2-related parkinsonism: clinical and pathologic data. Neurology. 2008;71(13):1021–1026. Cao M, Gu ZQ, Li Y, et al. Olfactory dysfunction in Parkinson’s disease patients with the LRRK2 G2385R variant. Neurosci Bull. 2016;32(6):572–576. Iranzo A, Serradell M, Vilaseca I, et al. Longitudinal assessment of olfactory function in idiopathic REM sleep behavior disorder. Parkinsonism Relat Disord. 2013;19(6):600–604. Cavaco S, Gonçalves A, Mendes A, et al. Abnormal Olfaction in Parkinson’s disease is related to faster disease progression. Behav Neurol. 2015;2015:976589. Postuma RB, Berg D, Stern M, et al. MDS clinical diagnostic criteria for Parkinson’s disease. Mov Disord. 2015;30(12):1591–1601.